So, George Clooney is 52 today (we can’t believe it either). Enjoy an excerpt from George Clooney, by Kimberly Potts. George Clooney had often told reporters he wouldn’t attend the Oscars until he was nominated for one. He didn’t expect, though, that one trip to the Academy Awards was all he’d need to take home one of the little golden guys. After nearly twenty-five years in Hollywood, more than a dozen failed TV shows, a breakout role in a hit TV series that gave him his firstbig success at age thirty-three, and another decade of critical film hits (Out of Sight) and box-office misses (Batman & Robin), 2006 was the year that his industry cohorts decided Clooney was a genuine triple threat: he had become the first person in the history of the Academy Awards to be nominated for three different Oscars in two different movies. All of a sudden, in 2006 Hollywood had decided that Clooney was one of the best actors, one of the best writers and one of the best directors in the industry. And all the big-screen triumphs he was at last enjoying had come not because he had motored along the usual path to success in Hollywood. Instead, Clooney had done things his way, shrewdly switching back and forth between projects with big box-office potential and smaller, more independent movies he felt passionately about, working with actors and filmmakers who shared his goals of turning out good work they could be proud of listing on their résumés and, in a reflection of his personal ethics, making it a priority in his professional life to treat people, at every stage and level of the filmmaking process, fairly. Clooney had become a genuine movie star, one of the biggest in the world, one of the most beloved and most respected—and, judging from the crop of those coming up behind him, one of the last real movie stars in Hollywood. As unlikely as it might have seemed earlier in his career, when he felt lucky to land parts in movies like Return to Horror High and Return of the Killer Tomatoes! and to be playing sixth banana to Mrs. Garrett and the girls on The Facts of Life, Clooney had deftly managed to sustain and expand upon a career in an industry that is notoriously fickle. He’d become a better actor, one capable not only of genuinely terrific performances in movies such as Steven Soderbergh’s slick heist crime dramedy/romance Out of Sight and Joel and Ethan Coen’s comic adventure O Brother, Where Art Thou?, but also of aligning himself with filmmakers who could draw out his best acting efforts and who had likeminded commitments to making movies that mattered, that provoked, that entertained . . . that, above all, did more than just line a leading man’s pockets with an eight-figure payday. He’s famous for twice being People magazine’s Sexiest Man Alive, for his penchant for practical jokes and his vow never to remarry, as well as for his Oscar-winning and Emmy-nominated acting career. But George Clooney’s reputation as a celebrity belies his essential seriousness, as a businessman, a humanitarian, and, of course, in his ascendancy to the Hollywood A-list. In this updated biography of one of Hollywood’s most colorful leading men, pop culture expert Kimberly Potts traces Clooney’s life from small-town boy to big-screen idol. Clooney slowly and deliberately built a résumé that took him from TV stardom on ER to a winning film career as a serious actor, writer, producer and director. Along the way Potts fills us in on Clooney’s early attempts to break into film (including his Batman flop), his many well-publicized romances, his political and humanitarian efforts, plus a major fight with director David O. Russell on the set of Three Kings. Potts also recounts how Clooney has gained success and acclaim with his shrewd strategy of alternating blockbuster movie roles, such as the Ocean’s franchise, with less lucrative “passion” projects – such as Syriana and Good Night, and Good Luck – that reflect his personal ethics. He won an Academy Award for the former and rave reviews for the latter, and has continued to earn accolades and Oscar nominations for smart dramas such as Michael Clayton and Up in the Air. Including fresh interviews, essential Clooney photographs, a filmography, a timeline, and a list of his favorite 100 films, this is the book no Clooney fan will want to be without. George Clooney: More Oscars on the Way? 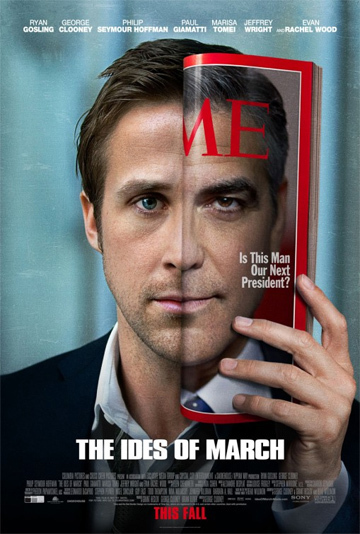 In honor of The Ides of March‘s release in theaters today, Applause Books author Kimberly Potts explains George Clooney’s current career, and why we may be seeing a lot less of him in front of the camera in years to come. All those interviews and late night talk show appearances George Clooney and his Ides of March co-stars have made in the last few weeks have led to a plethora of stories about how a whole lot of celebrities have gone skinny dipping at Clooney’s famous villa in Lake Como, Italy. But what they haven’t gotten across about the movie is that it could very well lead to the Oscar winner’s next Academy Award nomination(s). In Ides, which hits theaters today, Clooney plays Mike Morris, the governor of Pennsylvania who’s now a Democratic presidential contender. Ryan Gosling pops up as his campaign leader, and a scandal later, we’re knee-deep in a thrilling political drama that resonates all too strongly with recent real-world political scandals, and sparks all sorts of discussions on matters of politics, ethics and doing things for the greater good. And while Gosling’s performance is stirring all the buzz, don’t be surprised if Mr. Clooney isn’t a nominee for Ides when Oscar nominations roll out next year. Clooney stars in the movie, he co-wrote the script and directed Ides. And, as arbiter of all things Hollywood awards-related, GoldDerby.com, points out, the only thing potentially standing between Clooney and Ides of March gold is the fact that his second movie of the year, the family dramedy The Descendants, is so terrific it may steal his Ides thunder. Still, one-upping yourself is not a bad position to be in, and both movies are payoffs to what has been Clooney’s career philosophy: to agree to star in the movies studios want him to make, and then using his position to get made the movies he personally wants to make. In the newly revised and updated release of my Clooney biography George Clooney: The Last Great Movie Star, Clooney asserts that his ultimate goal is to work only behind the scenes, making his movies, but not starring in them. Is that possible? Even Clint Eastwood, whose career I think Clooney’s is modeling, still takes an on-camera role now and then, and it’s tough to imagine a time when Clooney’s face on the screen and name on the poster wouldn’t be a tremendous selling point for a movie. Besides, I think the book’s title only becomes more and more true every year. With entertainment fans’ attention constantly being pulled in dozens of directions, celebrity of Clooney’s magnitude becomes a rarer thing. He is The Last Great Movie Star. In this updated biography of one of Hollywood’s most colorful leading men, pop culture expert Kimberly Potts traces Clooney’s life from small-town boy to big-screen idol. Potts fills us in on Clooney’s early attempts to break into film (including his Batman flop), his many well-publicized romances, his political and humanitarian efforts, plus a major fight with director David O. Russell on the set of Three Kings. Potts also recounts how Clooney has gained success and acclaim with his shrewd strategy of alternating blockbuster movie roles, such as the Ocean’s franchise, with less lucrative “passion” projects – such as Syriana and Good Night, and Good Luck – that reflect his personal ethics. He won an Academy Award for the former and rave reviews for the latter, and has continued to earn accolades and Oscar nominations for smart dramas such as Michael Clayton and Up in the Air. Available now from Applause Theatre & Cinema Books.